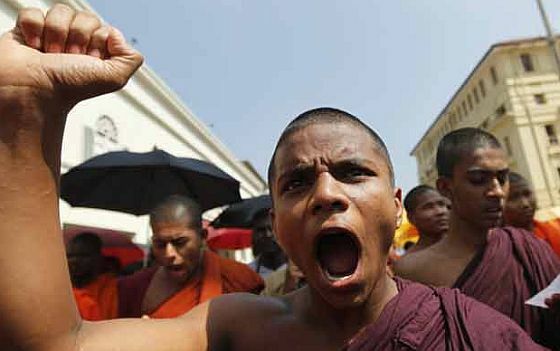 Jan 12, Hikkaduwa: A group of extremist Buddhist monks and laymen attacked two Christian religious centers today in Hikkaduwa, Sri Lanka’s tourist city in the south. By VOICE OF THE PERSECUTED in Asia, Christian Persecution News, Sri Lanka on January 14, 2014 . I wonder what fueled this rise in Buddhist extremism and intolerance in the area. Is it part of the spiritual war against God and His people that is on the increase throughout most of the world? If there were no supernatural spiritual forces aligned against the teaching and the hearing of the true Gospel what would be the logic of anyone finding it so offensive they would be provoked to violence? That video was an eye opener for me……….the hate was absolutely intense ! It is shame to identify them as Buddhist & Buddhist monk. They are devils. They attack people who are worshiping God . I don’t understand why this kind of violence occur against harmless Religious people? According to Bible these are the signs of end time. Anybody can destroy the property & lives but nobody can destroy the faith. If whole country become followers of Jesus, then only people will enjoy the peace & joy. Let the God take care the war against His people. Let us forgive them as Jesus teaches us ” Lord forgive our sins as we have forgiven our enmities “.